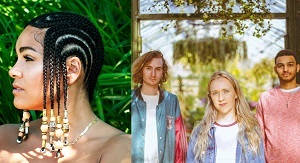 The first independent artists signed for sync representation are two time Polaris Prize nominee Zaki Ibrahim and the sunshine pop of St. Catharines based band The Bae Beach Club. Pitchfork described Ibrahim’s The Sceret Life of Planets as “a future-soul marvel that connects sounds across time and oceans, creating thrilling moments of pop music synthesized through her wise and worldly vision”. Substream Magazine called The Bae Beach Club’s music as “a warm flood of pure pop bliss that keeps you coming back for more”. For the past fifteen years, Popguru Sound & Vision, in partnership with New York based Steven Scharf Entertainment, has successfully placed music in North American film, television and commercials. At the inaugural Canadian Sync Awards, two of the four nominees for Sync Artist or Songwriter of the Year were Popguru Sound & Vision artists: Grand Analog and the Wilderness of Manitoba. Grand Analog has had over sixty syncs including a song used in a North American advertising campaign and two songs featured in a movie starring Eva Longoria. They also wrote the theme song for an animated television series. A Wilderness of Manitoba song appeared three times in an episode of popular NBC television drama This Is Us and another from the same EP played over the final scene of an episode of Elementary.